In this blog, I will be performing CRUD operation with ListData.svc with LINQ query. So let's start the implementation. Create a console application project. 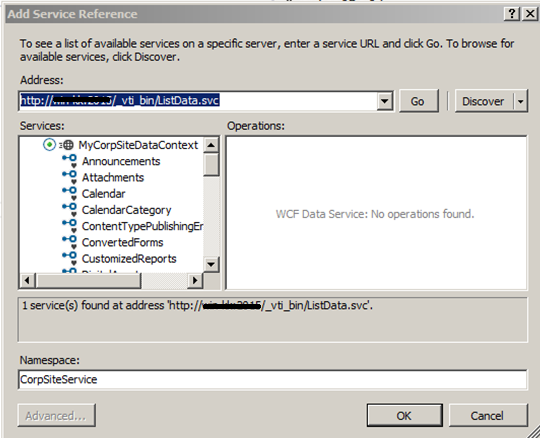 So the very first step is to consume the service, adding a service reference is very similar to Web service and WCF service. Just browse the service, add the service reference to your project and play with it. Then add the service reference to your project in Visual Studio. Once service reference added. You may start consuming the service to manipulate SharePoint list data. Here is C# code for CRUD. If you want to browse the service details in Visual Studio, then double-click on service reference. You may see a screen below. Very nice blog on REST API in Sharepoint 2010.